#2 The origin of the word kimono is Greek. #3 Easter is a REALLY big deal. At a recent meeting of the hens, the topic of conversation somehow steered toward sweets (probably my fault). One of the girls said something to the other in Greek, then turned to me, nodding knowlingly as if I had a clue – I’m Armenian and don’t speak a lick of Greek over here. Then, she said one very long word. The fact that I could neither spell nor pronounce it did not stop me, of course. There I was, typing away frantically on my phone, desperately seeking a recipe for whatever this dessert was that she absolutely loves, but can not have because it is just too difficult to make. Too difficult? We shall see about that. Now, to be clear, for Greeks to deem anything too difficult means that it is truly a pain in the derrière for even the French to fathom. Everyone knows French recipes are often either elegantly simple or painstakingly difficult. My experience with Greek cuisine is quite limited, but from what I have attempted, I would say that Greek recipes rank up there with the Arabic and French for mouthwatering, but complicated. Case in point: Pastitsio, the Greek interpretation of lasagne crowned with Béchamel sauce. Their sweets, on the other hand, are typically not as involved. Only a handful of ingredients, tossed together, drenched in luscious syrup. Greek kitchens are buzzing with activity this time of year. There is so much to do. Big, elaborate recipes from ancient times are revived. This not to say that we Armenians do anything simple, either. We insist on baking a special Easter cake called Paska. This seemingly plain cake with a hint of orange favour is actually a fuss to make. Look the wrong way and it instantly deflates. This year, I decided to start my own Easter tradition with my grandmother’s Nazook (buttery streusel-stuffed cookies) and Greek Galaktoboureko. After learning to spell it, pronounce it and make it, I risked death at the hands of the Greek gods with a few changes to the original recipe. This luscious phyllo custard pie got a crunchy foundation of cinnamon, brown sugar and crushed pecans and a crown of orange marmalade. Hopefully, the Greek pantheon will forgive me. Mix with sugars, cinnamon, salt. Pour milk and a slice of orange peel into a heavy-bottomed pot and place onto medium heat. Meanwhile, whisk eggs and sugar together and set aside. Use a wooden spoon to stir the warm milk gently and slowly incorporate the semolina. Stir continuously until the mixture thickens enough to coat the back of the spoon. Remove the pot from the stove and temper the egg mixture with the warm milk, a bit at a time. Add vanilla and a knob of butter and stir. Put the lid on and set aside. Butter a glass baking dish and line with a sheet of phyllo pastry. Brush the top with melted butter and lay another sheet of dough on top. Sprinkle some streusel evenly over the pastry. Continue with this layering for 10 sheets. Gently position the edges of the pastry sheets over the edges of the baking dish.over the sides of the dish. Pour the custard cream and spread evenly. Fold the hanging phyllo sheets to cover the custard, buttering each time. Lay 3 phyllo sheets on the top, folding them in half and tucking in the sides. Use a sharp knife to cut slits in the top phyllo layer, vertically and horizontally to form 3 columns, 5 rows. Pour the remaining butter into the cuts and the edges. Sprinkle a bit of water over the top – this helps keep the thin pastry sheet from flying off. Bake for1 hour, til golden brown. Combine water, sugar, cinnamon stick and lemon in a heavy-bottomed pot set over medium heat. Stir until it reaches a boil. Remove from the heat and discard the cinnamon and lemon. Remove pie from oven and set to cool 10 minutes. Pour the syrup evenly over the pie. Allow the pie to cool 4-5 hours before cutting and serving. 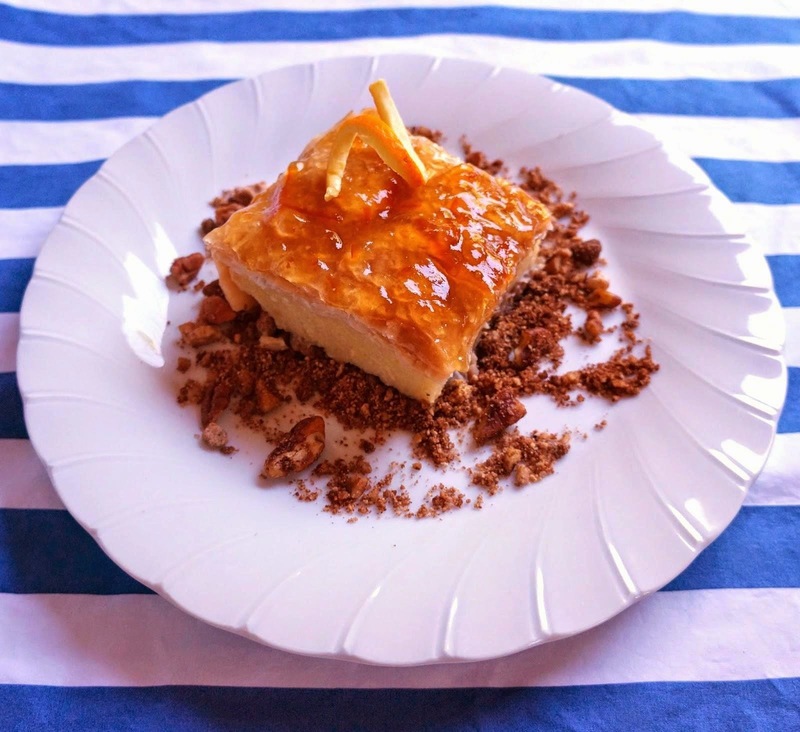 Baklava Fans, hold on to your hats, because galaktoboureko is going to rock your world. The first time I made it was for Mom’s birthday and found a mob outside my window, demanding some. Despite the lengthy instructions and seemingly difficult technique, it was actually fun to make, especially with the help of my li’l blue-eyed beauty. Neither the pecan streusel nor marmalade are authentic to the original recipe, but provide a nice crunch in texture and more punch of the orange flavour to this very unusual dessert. This Easter, go Greek! You put me to shame! I just not a committed baker! I know enough to get by! :o) This looks like a great recipe, well, anything with phyllo dough is always impressive and tasty! Hooray for desserts!